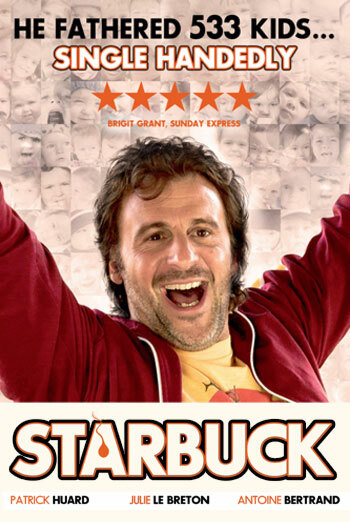 STARBUCK is a French language comedy drama in which a middle aged man discovers that sperm samples he gave two decades ago have resulted in the birth of more than 500 children, many of whom have filed a lawsuit to force him to reveal his identity. The film opens with sight of the main character, as a much younger man, masturbating in a clinic while leafing through some pornographic magazines. Elsewhere in the film there are verbal references to masturbation as well as a scene in which one of the man's friends bemoans his own inability to achieve an erection, describing this in graphic terms. The film also contains some references to drugs. For example, we see the main character trying to grow cannabis in his flat. Later on he finds out that one of his many children is a heroin addict. We see the woman having a fit as a result of an overdose and then see her lying on a bed with a hypodermic syringe dangling from her arm.